In 1962, just after my 13th birthday my parents anounced that we were going to move house, not very far, about half-a-mile, to the road where my paternal grandmother lived, in fact just a few houses away from her. I was excited by this as it was a larger house where I’d be able to have a bedroom of my own and I was very eager to move. The move was accomplished just before the school summer holidays and as I already had suspected, there were no boys of my own age living nearby. Next door were two young brothers who were six or seven years younger than I was, and down the road in either direction were a few boys round the age of the boys next door. My brother who is three years younger than I am fared a little better as these lads were closer in age to him. For entertainment that summer I therefore had to accept the company of my brother and the younger boys next door, and of course my young sister, or no company at all. Lurking in their garden was a four-wheeled trolley which belonged to the two brothers. It was made of pressed steel with a turntable handle at the front end; it was large enough to carry the two boys quite comfortably. In a very grubby and delapidated condition I suggested we clean it up so we could play with it in the woods behind our house, so a bucket of soapy water and a brush and then a drop of oil on the moving parts and we had a useable trolley. Manufactured by one of the major toy companies it rejoiced in the name of “Battle-Wagon” which was printed down the side of the once bright red truck. A bit of oil on the wheels and turntable and I was ready to give the boys an interesting and exciting ride around the narrow footpaths of the idyllic woodland behind our houses. A few old cushions on board and the two boys would sit facing forward, the younger boy in between the legs of the older one, their legs a tangle of short trousered grubby knees and wellington boots; down in the woods we usually wore our wellingtons, whatever the weather, it was the only protection our legs had against the low-lying brambles of the wooded pathways and the all pervading stinging nettles and it also mattered not if our feet became a little muddy which inevitably they did! Sometimes my sister who was about the same age as the neighbours would join us and they’d take turns riding. By the time my first summer in the new house had ended, my brother and I had pulled those lads (and our sister) countless miles, not only through the woodland, but up and down the local streets as well and the turntable unit was showing signs of metal fatigue, which, combined with the rust of years of neglect, signified its days were numbered. One November evening, in the dark, the battle-wagon finally gave up the struggle to survive whilst being pushed wildly at great speed down the road and bumping up against a kerb. We just sat and looked at it in disbelief, the handle had fractured and bent up underneath causing the turntable unit to separate from the wagon; we were shocked, no more summer safaris, no more autumn adventures through the fallen leaves in the woods, no winter wanderings when all the undergrowth had died back, all thoughts of future treks had disappeared with the sight of the twisted metal we saw before us. Guiltily we dragged the remains of the wagon home and hid it at the bottom of their garden where, sadly, it eventually rotted away completely, the only evidence of its existence remaining in the memories we kids would keep with us forever. Mike, loved this little bit of our history. You should write your life story, it would be very interesting. Actually, I penned this one ages ago, been trying to find a suitable photograph ever since to go with it. In the end I cobbled one together from three separate images! It will be up on my Memories section of my website before too long. 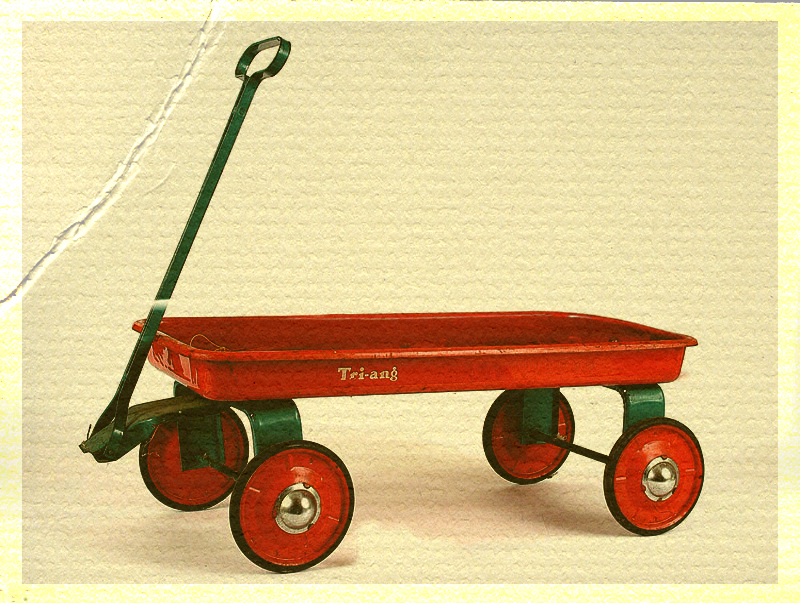 I see that this particular ‘Trolley’ was manufactured by Triang. They made some fantastic toys, and were really built to last. My parents bought me a beautiful Triang toy steam train from ‘Watts’ toyshop in Bridgend. It was fantastic ‘Signal Red and Black’, and just about large enough to sit on the roof of drivers compartment. Although it was never designed for this. It still lasted for years and I had many happy hours of play, riding my little train up and down the lane at the end of our street. They don’t make em’ like that anymore – Even ‘Tonka’ toys are made of plastic these days. Happy times though. Randell, my brother also had one of the Tri-ang “Puff-Puff”s as they were known. When he was very young the pavements outside our house were resurfaced and Norman Norris the roller driver towed the Puff-Puff behind the roller as he was working! Unfortunately I never saw this because I was in school. Oh, I have it now, in my museum shed! Brilliant – I didn’t know they were called the ‘Puff, Puff’, but I do remember the sound it made. Unfortunately mine stopped puffing after a while, I was gutted, but I loved that train, wish I still had it. Thanks David, your memory and comment are much appreciated.